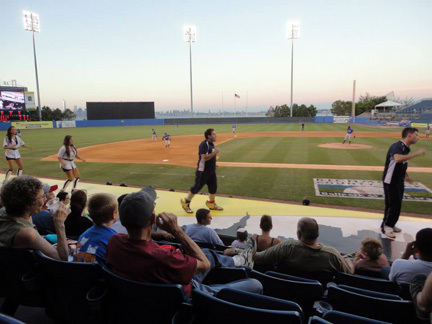 Participants Enjoy a Staten Island Yankees Baseball Game! On July 29th, 2013, InterExchange hosted a cultural event in New York City for all of our J-1 participants in the area. Participants and InterExchange staff rode the Staten Island Ferry to the Richmond County Bank Ballpark to watch the Staten Island Yankees play the Aberdeen IronBirds. With 22 InterExchange staff members, 12 Work & Travel USA participants and 25 Career Training USA participants, InterExchange was well represented! Participants came from China, Ireland, Lithuania, Russia and several other countries. InterExchange staff met participants at the ferry terminal and distributed t-shirts, wristbands and bike lights. The group enjoyed impressive views of the downtown New York City skyline and the Statue of Liberty while traveling to the stadium. All InterExchange participants received a voucher towards food and beverages at the venue. Participants enjoyed Philly cheese steak sandwiches, hot dogs, pretzels and soda. 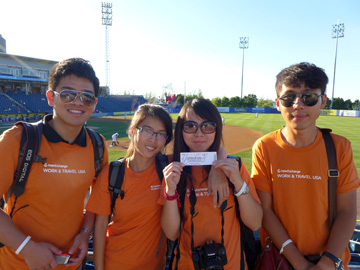 Since baseball is not as popular in other countries, InterExchange staff members talked with students and explained the rules of the game. 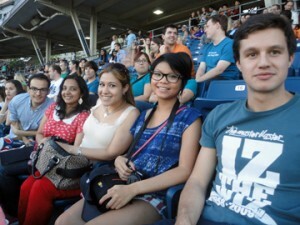 For most of the students, this was their first baseball game and first time eating a hotdog. It was the perfect evening to watch a ballgame. The group cheered on the home team and learned the words to "Take Me Out to the Ballgame". InterExchange participants rode the ferry back to Manhattan together with new friends and a new understanding of a great American tradition.